At first example, entry short at C or D would be against LT area A.
Shouldn’t we wait for it to break or try to enter at some kind of stall at lower time frame at B area? The article didn’t really address how we would enter. And the answer of course (as with all setups) is really “it depends upon the context, which should include a wider HTF perspective plus some insight into the LTF price action”. Yes, entry right at C or D is at the same level as A. So if you wanted to place the order a couple of ticks lower in order to confirm the break, then that’s fine, provided that it still meets your R:R needs. 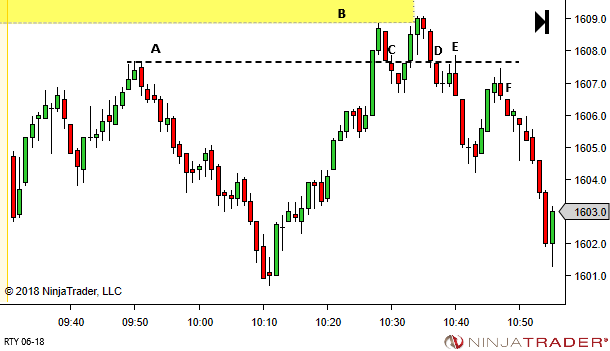 And yes, if you get some kind of stall in the area of B, then this absolutely could be a signal to short. Noting of course that you would still deem the area at A to be a potential source of support. Volatility contraction/expansion patterns is a very common topic in your articles. However, I barely be able to relate these opportunities with some of the YTC PAT setups. For example, in this particular case, what kind of setup would be? A LTF BPB in the yellow shaded area? And other question: Had missed the opportunity at I (shaded region), would you consider the around of 1601 level (two swing lows at 11:30 and 11:35) as a support, now resistance, to enter in the retest (12:05)?? Yes, correct. A breakout from a period of volatility contraction is always treated as some form of pullback setup. You’ll find these often in one of two forms, when viewed from a YTC PAT perspective. A VERY short duration contraction might appear within a single complex pullback. The continuation break from that essentially offers an LTF entry into that CPB, if you hadn’t already entered earlier in the CPB and held through the compression. More common though, with longer duration patterns, it will display as some form of sideways trend. The continuation break will either be an “intra-range” PB, or a BPB if it occurs outside the boundary of the sideways trend. Volatility patterns are not “official” YTC PAT. I look at the price structure from the YTC PAT trend perspective. 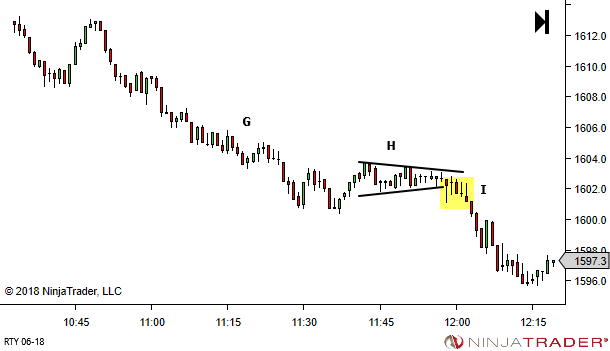 But these triangles just seem to jump out at me, providing greater confidence in trade entry due to both methods supporting the idea. And definitely yes, if you don’t get in at the shaded area, the single candle pullback at 12:05 is the most obvious setup. Your explanation makes a lot of sense, so thank you very much. 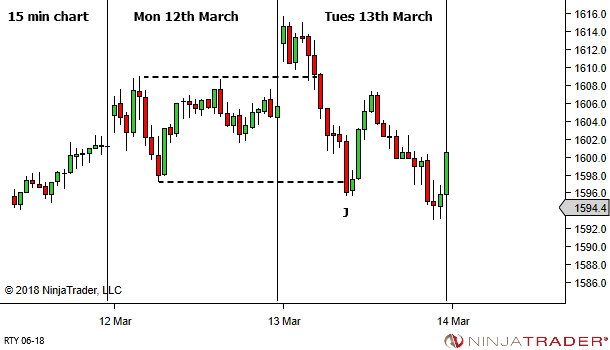 I think I’ll start to seek and study this kind of patterns as a part of my post-session market structure review. No trading them yet, cause I prefer keeping my focus on the very basic and obvious YTC PAT setups for now. But it seems a very interesting area to try to add to my trading in future.